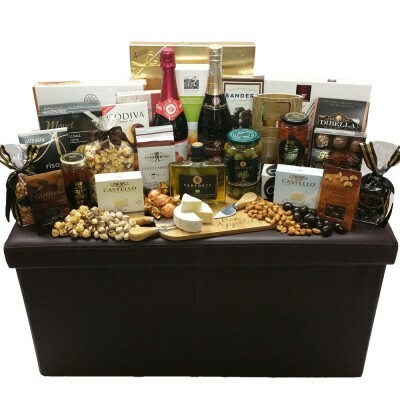 A wide array of mouthwatering treats including Chocolate Factory handcrafted truffles, Godiva crème brûlée truffles, Belgian chocolate seashells, an assortment of nuts, chocolate popcorn, maple tea, cookies and a chocolate pizza slice come attractively arranged in a wicker basket. This stylish wooden trunk makes a great gift even after the goodies are gone. Overflowing from the trunk are gourmet delights and chocolate treats that are sure to be devoured. 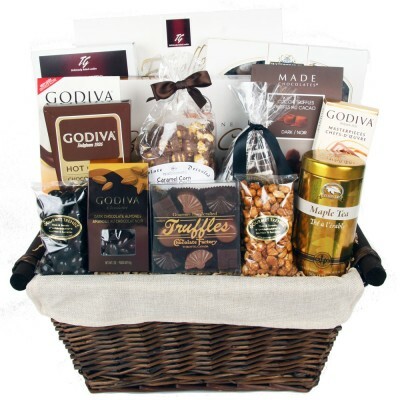 Godiva Masterpieces caramel milk chocolates, Godiva dark chocolate almonds, honey peanuts, ice wine candies and an assortment of chocolate biscuits are balanced with a savoury selection, including green olives, Brie cheese, crackers, pretzels and more! This large hamper is packed with marvelous goodies to share. SeaChange smoked salmon pâté, Castello Rosenborg Danish Brie cheese, an assortment of fine crackers, pepperoni snackers, black olives, cocktail gherkins, butter flavoured pretzels, espresso coffee, biscotti, a selection of Scottish shortbread and biscuits, Godiva hot cocoa, handcrafted truffles and more fill this sturdy Kubu rattan basket. Show your appreciation by sending this gift that is perfect for sharing. 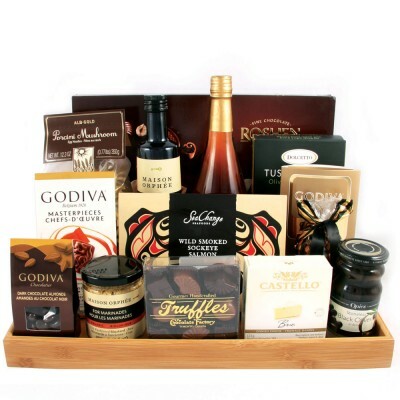 Wild smoked sockeye salmon, exquisite Godiva caramel chocolates, handcrafted truffles, Godiva dark chocolate almonds, honey peanuts, gourmet crackers, cheese, olives, old-fashioned mustard, extra virgin olive oil, sparkling cranberry cider and more delectable goodies come arranged on a bamboo tray. 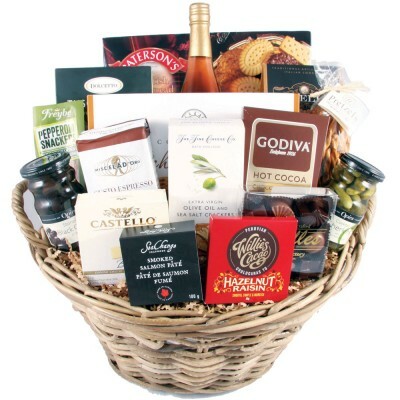 The ultimate basket that will surely please a large group. Savour the selection including Godiva chocolates, chocolate covered almonds, honey peanuts, cocoa truffles, fine assorted chocolates, pretzels, biscotti, an assortment of crackers, cheese, black olives, cocktail gherkins, purple fig preserve, a bottle of sparkling cranberry cider and other sweet and savoury products. They come beautifully arranged in a large cloth lined wicker basket. 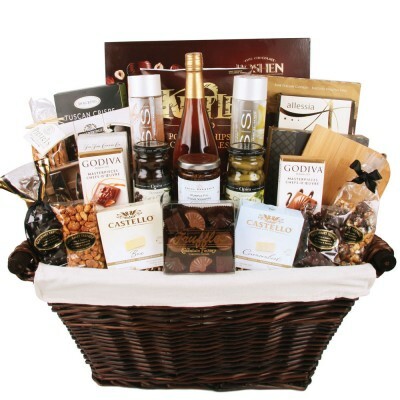 A high-style gift basket that is sure to impress. 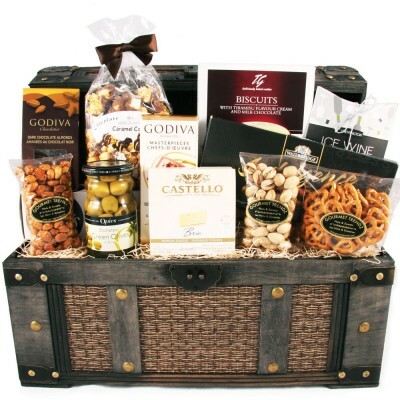 The sophisticated faux-leather trunk is overflowing with sensational goodies including handcrafted truffles, Godiva Crème Brule truffles, double chocolate biscotti, Godiva coffee, an assortment of chocolates, cookies, crackers, cheese, green olives, olive oil, nuts and much more.